It’s the age-old debate dividing families and causing drama. No, we’re not talking about controlling the TV remote, but air conditioners versus ceiling fans. Money-conscious homeowners ponder the question every summer as the mercury exceeds 30°C across Australia. Is the extra cost of air conditioning worth the comfort, or are ceiling fans adequate? Unfortunately there’s no universal approach to this. On the bright side, however, a bit of research should guide you in the right direction as to which is the better choice for your family and your budget. Who knows, you might even strike a winning balance between both air conditioners and ceiling fans. Air con vs ceiling fans: Which is better? Before driving hurriedly down to the appliance store, it’s important to consider the benefits that each cooling method can bring to the table. From the old window-rattler kind, to a ducted unit, to a portable one, to a modern split system one, and to the more exotic evaporative kinds, modern air conditioners have been in our lives for around 100 years. Once installed, air conditioners are a great way to keep cool while sinking back a beer on a Sunday afternoon watching test cricket. During a heatwave, you will probably notice hermit-like behaviour on your behalf, coming out of your chilled room only for snacks, drinks and for toilet breaks. It doesn’t have to be like this though. While this scene is common for window and split system air conditioner users – where effectively only one room is chilled – ducted air conditioners have the ability to cool a whole house, and some have ‘zoning’ capabilities where you can make one room cooler than the other. This works especially well for apartment buildings, and chances are in an apartment you already have ducted air conditioning. For maximum chill factor, you simply cannot beat an air conditioner on a scorching summer’s day. The main drawback with air conditioning is the cost. The costs of the unit price, installation and power usage. 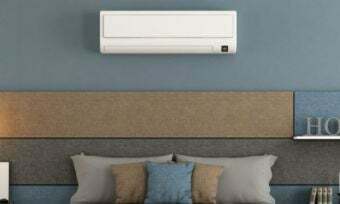 As broken down in this article, you can expect the humble split system air conditioner to cost around 33c-40c an hour. Say you run it eight hours a day, for the month of January, at the extreme end you could expect that unit to cost nearly $100 in power alone! Installation by a licensed technician, maintenance costs and unit costs also add up here. Ducted is yet more extreme, running anywhere from $1.48 to $1.94 an hour. Though, ducted systems are most commonly found in apartments, and apartments are usually part of an embedded electricity network to get a better deal on power. Being that split systems can run anywhere from $500-$2,000+ in price, and ducted systems into the tens of thousands, you might find you blow your cool over the cost. With air conditioning, you’ll have to weigh up whether the cost to benefit ratio is worth it. The humble ceiling fan – where would we be without it? Sweating profusely, probably. Ceiling fans are a staple in many Australian homes, and for good reason. Their fuss-free operations that whisks hot air up and cool air down is beloved by Aussies in summer, and fans are such a staple that many people don’t pay any attention to them. A common sight in the north of Australia is to have airy, open houses with more fans than you can poke a stick at operating at all hours of the day. Though, there are fairly prominent shortfalls of using ceiling fans. The most obvious is that they don’t actually cool the environment; they just push cool air around, which can eventually wick your sweat away. It’s no surprise that when you enter a fanned room, you don’t feel the chilled presence like with an air conditioner. Another shortfall of the ceiling is the obvious risk of blades swirling above your head. If your roof is rather short, then stretching your hands above your head can be a perilous task. Getting your fingers whacked in a fan isn’t a great feeling. Furthermore, some fans are just downright noisy! Some fans on their maximum level feel like your whole house is about to take off! Air cons on the other hand usually hum away in a dull monotone or with no noise at all. 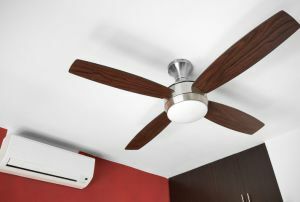 The main drawbacks of ceiling fans are pretty stated; is that enough to make you not a fan of ceiling fans? On the plus side, the main benefit of ceiling fans is their supremely low cost to run. They can cost as little as 2c per hour to run, which makes them an obvious choice from a cost perspective. This allows you to run them for longer, and at less cost than an air conditioner. 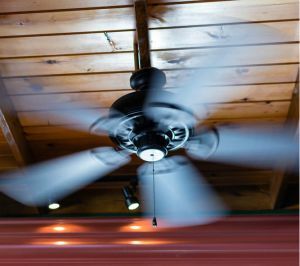 A ceiling fan can cost 20 times less to run than a split system air conditioner, but is the sacrifice of a completely chilled room or house worth it? One way to fan out a nasty power bill is to use both air conditioning and ceiling fans in tandem to achieve maximum comfort. We know that the propensity for maximum chill with air conditioners can’t be beat and neither can ceiling fans’ cost to run. So, we have a conundrum, but you can strategically run both to save on power bills, yet achieve adequate comfort levels. One effective way in doing this is to run the air conditioner for a short period when you enter your home or room, then once it’s cool to use the ceiling fan to circulate the colder air. This eliminates the hardest work needed from both air conditioners and fans. If you’re still confuddled, then taking a quick look at the benefits and drawbacks of each cooling method can be particularly helpful. A low risk/low reward method in the ceiling fan: It’ll be cheaper to run with no ongoing maintenance costs, and you’re unlikely to have to spend big bucks on fixing a broken fan. A high risk/high reward method in the air conditioning: An air conditioner will be much more effective at cooling you down and making you comfortable, however it’ll require more money spent on energy, ongoing maintenance efforts, and potentially hefty expenses if your unit breaks. A lower-risk/medium-reward method in combining both: This is done by combining the benefits of both an air conditioner and ceiling fan at a lower cost than air conditioning alone, but with more adequate levels of cooling than ceiling fans alone. Your mileage may vary with this method. At the end of the day – that long, sweltering summer’s day – your decision will really depend on how bothered you are by the heat. If you constantly find yourself unable to stand daytime temperatures then your best choice is definitely the air conditioning, but if you’re not too bothered by the hot weather and don’t fancy larger energy bills, you might want to stick to using your ceiling fan. However, if you don’t fit neatly into either of those categories, you could always try using both – a combination of the two on medium intensity can prove to be more efficient and effective than the use of either one on its highest setting. Overall you have three main options; try them all if you can and see what yields the best results for you.